There’s barbecue sauce and then there’s barbecue sauce, which is to say you need more than one! 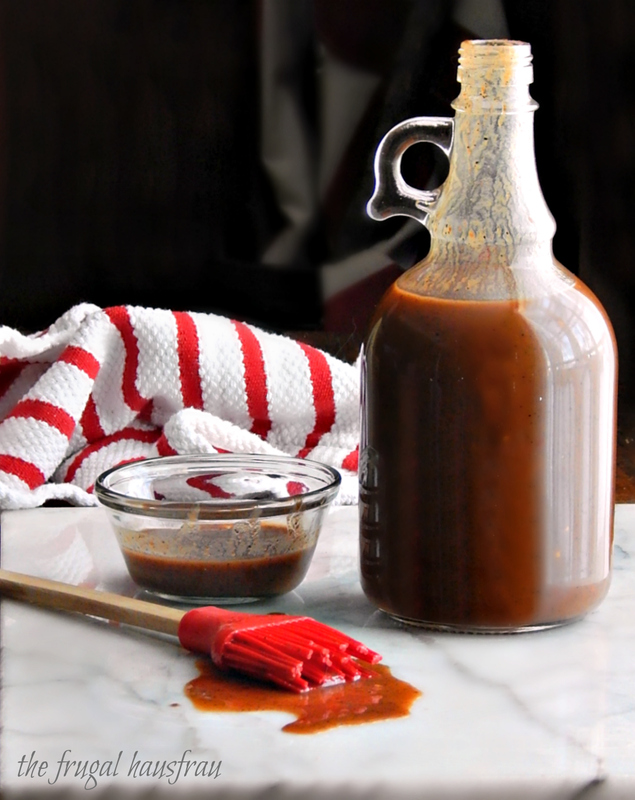 And this one, right here, Pride of Deer Camp Barbecue Sauce is one of our faves. It’s vinegary, it’s peppery, it’s potent. It’s Pride of Deer Camp Barbecue Sauce. We love Pride of Deer Camp Barbecue Sauce at our house. It gets used as a mop (meaning it gets slathered on the meat as it cooks or smokes) and as a marinade and it gets tossed into any of my Pulled Pork recipes (links at the bottom of the page). I use this to perk up items like I would a hot sauce and love it in Bloody Marys like my Overnight Bloody Marys. And when I was pregnant, I’d just sip this! I craved it! Really, nothing’s safe once there’s a jar in my fridge. This is a serious sauce – it will literally take your breath away if you’re not careful. If you “get” this, you’ll be smiling and nodding right now, and try it (and love it!) but if you don’t “get” it, well, well, you’ve been warned! My daughter was wild about this thin, vinegary, hot, peppery sauce – even as a kid. I sent her a bottle once when she was away from home – I knew she couldn’t live without it. I’m wild about it, too, and I bet you will be, once you try it. And the more you use it, the more you’ll want it. Pride of Deer Camp Barbecue Sauce has a long history, and somewhat of a cult following. Popularized by Jeff Smith, the Frugal Gourmet, the barbecue sauce is an Arkansas sauce (see comments, below) given to him by Sarah Lea, general manager of the Lenox House Hotel in Chicago. The original recipe makes 8 quarts and comes with a story about keeping it in a gallon jug under the kitchen sink. With that much vinegar, it should be safe, but I like to cut the batch down and keep it in the fridge. As much as I love this sauce, I’m not going to go through 8 quarts, even if I give some away as the recipe suggests, so I cut it back. When I cut the recipe back, I made a couple minor changes just for easy measuring. It doesn’t really make that much difference. But I did put the precise measurements in parentheses in case that matters to you. And you can see the original in the link above. Don’t cook this in aluminum, because the vinegar will react and ruin the pan, and you might want to stir now and then and just walk away while it simmers on the stove for the requisite 30 minutes. Store the barbecue sauce in glass. Canning jars work great or cute little growler jugs if you have one. I’m always saving cool jars and jugs for purposes just like this. If you are giving any as gifts, well, a growler is the way to go! This recipe calls for a lot of red wine vinegar, three cups, which can be pricey. I’ve made this before substituting plain old white vinegar, using the same amount and made it using two cups of white vinegar and a cup of leftover red wine that was languishing in the fridge. The difference is barely detectable with all the spices! Other than that, I can give you my standard advice on condiments. Stock up for the year during the summer, and watch the sales, especially during the summer holidays. I don’t use coupons as often as I used to when my store doubled them, but coupons are usually readily available and it can be worthwhile. Regardless, watch your coupon matching sites. They’ll alert you to great sales whether or not you use the coupons. If you miss the summer sales, they’ll be great condiment sales around the Superbowl, too. The priciest ingredient is the wine. Sign up for email alerts, speak to employees and you’ll find a great wine for a pittance. It pays to find a wine shop you like if you love wine. Yeah, you can get it at your basic liquor store or the grocery store, or the big box store, but it will be hard to beat that experience you get when knowledgeable staff points you to the offbeat wine you may have never heard of. A really nice wine doesn’t have to be expensive, but for cooking I often use a very basic cheaper wine or leftover wine. This a thin, vinegary and potent barbecue sauce. Mix together in a non-reactive pan (stainless steel or an enameled pan) and bring to a boil. Reduce heat to a simmer and simmer, covered, thirty minutes, stirring now and then. Best stored in glass containers. The mixture will separate upon standing; just shake back together. The recipe has been cut back from the original 8 quart amount. For easy measuring, I’ve adapted the ingredient amounts slightly, which makes little difference, but I also included the original fractional amounts if you’d like to be exact. This entry was posted in Click here for Fabulous Food Posts and tagged Barbecue, Barbecue Sauce, Condiments, Frugal Gourmet, Jeff Smith. Bookmark the permalink. wow, I’d forgotten about the frugal gourmet. wasn’t he a pedaphile? jeez. anyway, i love making bbq sauces from scratch. In a pinch I use Head Country regular and smoky, i think. Oh, I haven’t heard of that brand. If you use it, it must be tasty! I was just sickened when I heard about it. Forgot to mention: The chef was from Arkansas, but learned it when he worked at Deer Camp in Georgia. The sauce is in no way typical of Arkansas BBQ. Further, this recipe seems to have a heritage based in North Carolina. It’s ironic that Smith found it in Chicago! It’s fun to talk with someone who knows a bit about this recipe – I could probably go on for hours! 🙂 I did not mention when I was pregnant, I would sometimes sneak little sips out of the jar in my fridge!! It is really crave-worthy! This sauce is unbelievably versatile. I have a pot going right now with shoulder in it. My approach is to rub the shoulder with Cavenders Original, while I set up the smoker. The shoulder goes into the smoker in a V-cradle, fat side up, over apple wood, at 250 dF for about 4 hours. You may wish to turn at 3 hrs and go fat side down for 2 more. Make sure the final temp is a safe 155-160 using a meat thermometer. You need to actually smoke only for an hour or so; the remainder is slow roasting time. Bring the shoulder inside, place in a large stew pot (I use S/S lined, over a Nu-Wave Pro induction hob, set to 195 dF, covered), cover with the sauce and braise overnight. Works even with 7-8 Lb shoulders. Double check the meat internal temperature and remove for shredding. Defat the sauce and save for use at the table. Goes very well with no-mayo North Carolina vinegar/sugar based cole slaw. (Mamie Kirk’s comes to mind). Serve on cheap hamburger buns, maybe w/a little more mustard. OUTSTANDING. Oh my gosh, I want to live at your house!! That sounds divine!! I didn’t know about he Nu-wave, but I can see how this 2 part method would produce a gorgeous pork shoulder!! I think all your FF friend want to give you our address so you can send us some! I think you should have a Bloody Mary while you are brewing your special sauce Hilda! Sorry Frugal Hausfrau. I thought this was Hilda’s. But same sentiments to you! Funny – at our age there is room for a few mix ups! I’m always telling my son to do things like put the chicken in the dishwasher and forks in the laundry! I know the words, and the wrong one just pops out! I already told me that they can’t put me in the “home” because of that because I’ve been doing it for years! After reading the list of ingredients, I can see why this sauce might take your breath away while cooking. It sounds like a good sauce! By the way, I’m a fan of the Frugal Gourmet and bought 2 of his cookbooks years ago. I’m curious how he ‘fell from grace’. Google him, it was all rather ugly. Thank you. Sadly, it’s news to me.